Chopped strand mat, in fabric form, is sold on the roll and in small folded packages. It is made up of 1″-2″ long fiberglass strands that are randomly oriented and typically held together with a styrene-soluble binder that acts like glue connecting the fibers. The binder is designed to dissolve upon contact with styrene in polyester resin or vinylester resin. Once dissolved, the fabric softens, allowing it to drape around curved shapes. It comes in a variety of weights between .75 oz to 3 oz per square foot. The most popular weights are .75 oz and 1.5 oz. In the US, chopped strand mat is nearly always sold or specified in ounces per square foot. This is different than fiberglass cloth and fiberglass fabrics with oriented fiber layers (including woven cloth, stitched biaxial & triaxial fabrics, and the like). These are designated in ounces per square yard. When mat is attached to any of these fabrics (as in fabmat or biaxial with mat), the combined fabric is often called out in fabric weight. An example of this is our 738 Biaxial Fabric, which is a 1508 biaxial fabric with mat. This means 15 oz per sq yard of biaxial fabric plus an attached 0.8 oz per sq foot layer of mat. Can WEST SYSTEM® epoxy be used to wet out chopped strand mat? The answer is yes. The fiberglass strand in mat wets out with epoxy, but the binder holding things together does not dissolve. (It does get put into suspension and is sealed in the cured epoxy.) This undissolved binder causes the wet-out mat to remain a bit stiff compared to wet out with a styrene-based resin. For gently curving or flat projects like cabin soles or plywood decks, mat and epoxy should work fine. The fabric does not wet out perfectly clear with epoxy. Wet-out clarity of mat with epoxy varies somewhat with different suppliers, but none of them wet out as clear as a good 4 oz or 6 oz fiberglass cloth. The texture of the chopped strand mat is quite rough given its random fibers (many of which come loose when epoxy is applied). Mat requires a number of coats of epoxy to fill the profile at the surface. 879 Release Fabric can be applied over the freshly wet-out mat to compress the fibers and minimize the need for many of the buildup coats. Using release fabric in this way will result in a much smoother surface, and if you are going to allow the epoxy to cure before continuing, the surface is ready for buildup coats of epoxy or fairing putty after the release fabric is removed. 4 mil plastic sheeting can also be used over the still uncured epoxy and mat to compress the fibers. Trapped air bubbles can be removed by piercing or slitting the plastic over the bubble before the epoxy begins to cure. If the plastic was clean when it was applied, you can pull the plastic after the epoxy cures to a hard gel and apply epoxy fairing putty or buildup coats of epoxy later the same day. If you allow the epoxy to cure hard before pulling the plastic, be sure to sand the surface completely dull before applying more epoxy. When choosing chopped strand mat to be used with epoxy, look for mat that is soft and pliable. Some forms are quite stiff and may cause problems wetting out with epoxy. Stiff mat is often older stock and the fibers may take more time to wet out with epoxy. There are chopped strand mats produced without binder that work extremely well with epoxy. These products are referred to as stitched mats. The random oriented strands are held together with light stitching, which runs parallel to the length of the roll and is spaced about 3/16″ to 1/4″ apart over the width of the roll. The stitching eliminates the need for binders. These products tend to wet out a bit faster with epoxy and become more flexible on average than generic chopped strand mats. These stitched mats are suitable for use above and below the waterline for marine applications. Roll mat, the type held together with binder (not stitched), is used by some of our customers for new construction and repair for below water applications, but we have had some reservations on this if the boat stays in the water. To see if our concerns were justified, we compared samples of generic chopped strand mat (wet out with WEST SYSTEM 105 Resin and 206 Hardener) against samples made with our Episize™ fiberglass fabrics (wet out with 105/206) in moisture uptake testing under warm/moist conditions. The test environment was a room we affectionately refer to as “The Amazon Room”. This room is maintained at 100°F and 100% relative humidity, jungle-like conditions. All of the samples were accurately weighed on a gram scale before entering the chamber. Each specimen was weighed periodically until no additional weight gain was observed. The samples made with generic roll mat and epoxy experienced an average 2.3% weight gain over a two-month period. The Episize fiberglass/epoxy samples gained weight at a slightly lower percentage of 1.9%. Wet-out chopped strand mat and woven fabric test samples are prepared for moisture uptake testing. 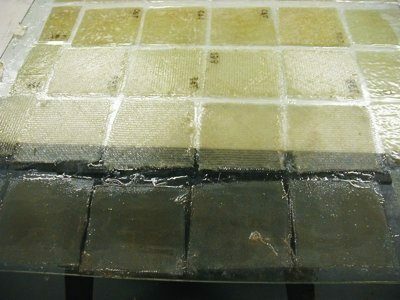 Visually all of the fiberglass/epoxy samples “whited-out” or became slightly more opaque during the test. We were not concerned about this because there were no obvious differences in appearance between samples made with our Episize™ fiberglass and samples made with generic chopped strand mat. Our test included three specimens of chopped strand mat, two different sources of 1.5 oz and one 3 oz. One of the samples was made with generic mat found on the fiberglass rack in our shop, and the other two were purchased from Composite Structures Technology in Tehachapi, California. Chopped strand mat can be used effectively with WEST SYSTEM epoxy for a variety of marine projects. Based on the results of our moisture uptake testing, we would feel comfortable using the mats that we tested for below the waterline applications including hulls that stay in the water for extended periods. Like any fiberglass applied to surfaces that will be used below the waterline, barrier coats of epoxy are necessary over the fabric to provide the moisture barrier required for long-term protection. 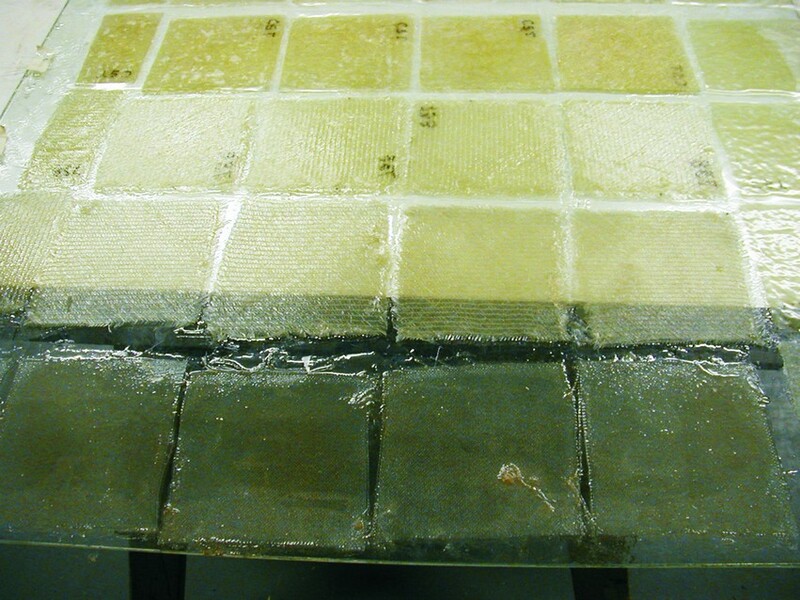 This entry was posted in Composite Fabrication, Epoxy Products, Materials Testing, Techniques & Tips and tagged 21, chopped-strand mat, Epoxyworks #21, Fiberglass, Spring 2003, Tom Pawlak on November 27, 2014 by ewadmin.